Tanks and Tops There are 9 products. 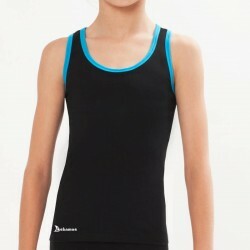 Tanks and tops for rhythmic gymnastics training and other sports. Our garments guarantee perfect settings for the exercises to be performed optimally shaping the figure. We have great variety of designs and colors. We also offer the possibility of giving it your personal touch by adding your name or logo of the club. Athletic top with a swimmer-like back ideal for the daily rhythmic gymnastics workouts. Our tops offer the gymnasts the style, safety and comfort they need to feel during practice or competition events. Personalize them with your name or club/team logo! Sporty tank top with racerback for rhythmic gymnastics training. This design is recommended for both summer and winter and you can personalize it with your name or club/team logo. Tank top. Ideal for rhythmic gymnastics training and daily basics. You can customize it by adding some of our exclusive transfers or with your name. Sporty 3/4 sleeve top for the coldest days, its design fits the body in a perfect way shirt allowing the movement that gymnasts need in their workouts and exhibitions. 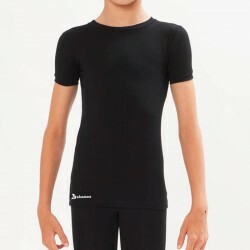 Short sleeves Top for rhythmic gymnastics training recommended for winter and spring seasons. Its anatomical design fits perfectly in the sleeves and bod part, it adjusts to provide maximum comfort. Personalize with your name to make it unique! Long sleeve top for rhythmic gymnastics training, recommended for winter. Its anatomical design fits perfectly the sleeves and body to provide maximum comfort. Customize it with your name to make it unique! Cotton tank sleeveless leotard for training. A unique piece for you to train with style and in a comfortable way in your rhythmic gymnastics practices! Cotton short-sleeve leotard. An unique piece for you to train with style and comfort in your rhythmic gymnastics practices!